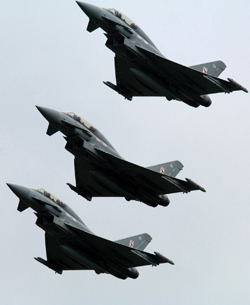 An order from Oman for Typhoon fighters has taken a step closer, following a statement by UK's Ex-Prime Minister, Gordon Brown, on 02 April 2010 confirming Oman’s intention to buy the aircraft to replace its Jaguars. Previously, no negotiations had been admitted by either the Omanis or the British. A contract could be finalized this year and, although no numbers have been mentioned, Oman currently operates 16 Jaguars from Thumrait. Around 24 Typhoon are likely to be required to start replacing these in 2013. If the deal is concluded, Oman would become the second Typhoon operator in the Middle East. Saudi Arabia has 72 of the aircraft on order which may be increased. An Omani deal could also benefit the aircraft’s prospects with other countries in the region that are in the market for fighters, namely Bahrain, Kuwait, Libya, Qatar, and the UAE. However, Typhoon is likely to face strong competition from Rafale in Kuwait, Libya, and the UAE in particular, seen as key prospects by the French. The U.K. has historically been the main supplier of defense equipment to Oman, but the Omanis also operate a squadron of F-16s, which were acquired from the United States.